If you’re unsure about using a lattice to enhance your fence, here are some ways to pull off this look and help your fence look brand new just in time for the full swing of fall! If you’re unfamiliar with a lattice, it is a screen-like pattern you might have already noticed, used as a cover for the space underneath your deck. Or maybe you’ve seen your neighbors use it to decorate their own fence. If you’re unsure about using a lattice to enhance your fence, here are some ways to pull off this look and help your fence look brand new just in time for the full swing of fall! So we started by mentioning how a lattice is a screen-like pattern. One of the biggest benefits of using a lattice is that it can boost the protective potential of a privacy fence. You could set up a lattice in your yard, and even in panel form, it would increase the amount of privacy you have. While these panels can stand on their own, you can also add them to your current fence. Typical lattices used in the garden will have three-inch openings in them. Although they look great, they might not provide as much privacy as you might want. Privacy lattices have openings that are only 1.5 inches wide. But if you need even more privacy – maybe for swimming in your backyard after skinny-dipping, you’ll need a full-on privacy fence. Sometimes, you might discover that your fence isn’t tall enough. If that’s the case, you’re in luck, because lattices can make your fence taller. These decorations will make your fence more fun to look at while also serving a practical function. But you should also keep in mind that your fences can only reach up to a certain height. Double check with your local homeowner’s association, or consult city and state laws to see how tall you can make your fence. 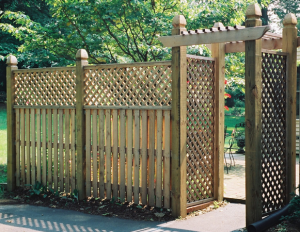 Using lattices in your backyard or for your garden can reduce your need for smaller fences. Maybe you could establish on on your deck to help arrange a reading nook. Or you could keep wild animals or insects from getting into your yard and ruining your garden or attacking your fence. Ultimately, it’s your choice!